Bulk custom imprinted Carabiner Pens, laser engraved. Our top quality carabiner pens are lacquer coated and provided with spongy grips. Budget Prices in USA and Canada for wholesale carabiner pens . American clientspay no taxes. We also supply wholesale blank (not imprinted) carabiner pens for $1.89 each . The unit prices below include your 1-color custom imprint on one side. Blank carabiner pens cost $1.89 each (minimum quantity: 125). You may order any quantity above the minimum. Production Time: 10 days after artwork approval; 3-day production is available at extra cost: contact us. Blank carabiner pens ship next day. Lacquer Coated With Soft Spongy Grip For Easy Writing. Carabiner Clips Onto Briefcase, Backpack Or Just About Anything. 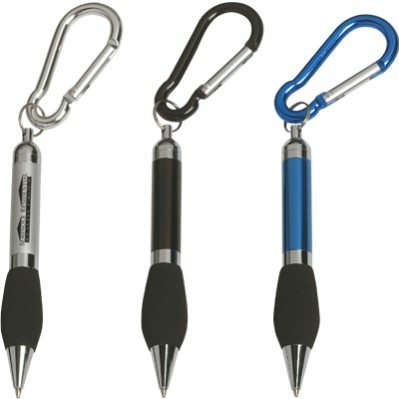 COLORS : Silver, Blue or Black Carabiner, with matching color Barrel and Black Grip, all with Chrome Trim. IMPRINT COLOR: Laser Engraves Silver. For Black Oxidation Add 0.35 per piece. REFILLS Black ink, medium point. PACKAGING Cello Bag, 250 per carton @ 30 lbs.